Whilst there are a lot of wonderful new items in the current Occasions catalogue, let’s not forget all of the lovely items in the Annual catalogue. (Remember all qualifying purchases from this catalogue also entitle you to free Sale-A-Bration goodies!). One of my favourite stamp sets in the Annual catalogue is the Crazy About You set. You may have seen it before as I believe it carried over from the previous catalogue. I got a little carried away making “similar but different” cards using this set and accordingly I have eight cards to share today. Yes, eight! And I think these cards illustrate the potential of this stamp set. I’ve made eight cards which are of a similar design so just imagine what you can come up with if you change up the colours, use different layout designs, combine the stamps with other stamp sets, and so on – there really is no limit! I used a very similar process for each of the cards featured today so will give an overview for the first card but will just highlight specific features for the rest of the cards. If there is anything you would like more information about, please do not hesitate to let me know. 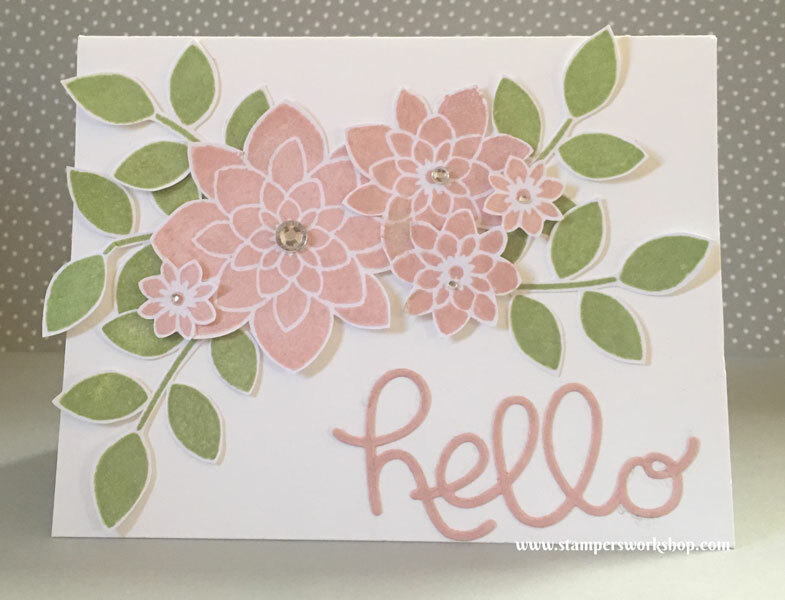 I stamped off the grey ink and stamped the flower design randomly over the background. (For some of the cards I used second generation stamping). Then I stamped the other flower design in blushing bride ink a few times and cut the different sizes of flowers I was after. I stamped the leaves in pear pizzazz and cut them out as well. (The flower does have a coordinating punch however the other solid stamp designs in the set do not). Next up I stamped the banner from the Endless Thanks stamp set. I also stamped the “Thanks” sentiment from this same stamp set. To give it a little more colour so it didn’t look too grey I stamped the solid heart in Blushing Bride, and added some glossy accents to it, at the end of the sentiment. I popped up the banner and voila! The card is done! 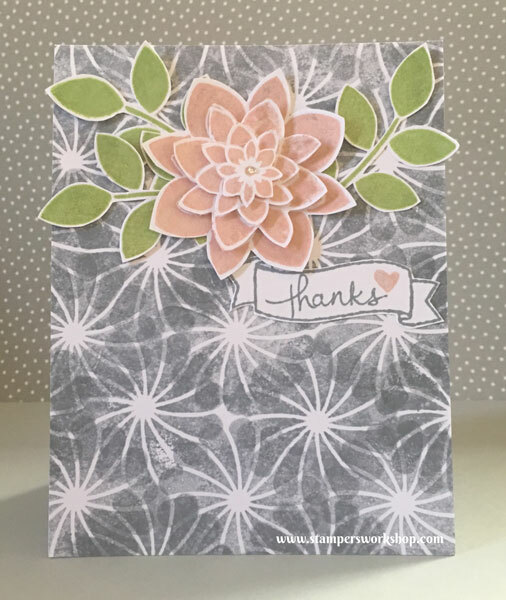 Materials used: Stamps – Crazy About You, Endless Thanks; Ink Colours – Blushing Bride, Pear Pizzazz, Smoky Slate; Rhinestones and Wink of Stella. Quite simple isn’t it? Let’s just step it up a little bit. This time I stamped the image repeatedly on the background and I made sure to overlap the image as I did so. I love how effective this looks. Isn’t it pretty? If you find it to be too grey, maybe you’d like the next card where I have added a little more white to lighten the look. Then again, maybe you’d like more of the Blushing Bride colour. Easily done! 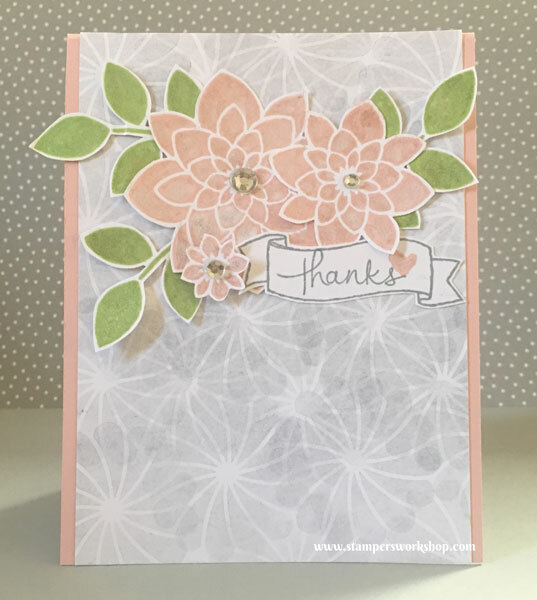 Materials used: Stamps – Crazy About You, Endless Thanks; Ink Colours – Blushing Bride, Pear Pizzazz, Smoky Slate; Cardstock – Blushing Bride; Rhinestones and Wink of Stella. Or maybe the Pear Pizzazz would be your preferred background colour? Materials used: Stamps – Crazy About You, Endless Thanks; Ink Colours – Blushing Bride, Pear Pizzazz, Smoky Slate; Cardstock – Pear Pizzazz; Rhinestones and Wink of Stella. For the next card, I decided to make the grey panel smaller so you could see more of the card base. On this base, I stamped THANKS repeatedly in Blushing Bridge to achieve a subtle tone on tone look. The card was going to be busy enough that it didn’t need the background competing. Next up is a different colour combination. I could have recreated this card with any number of colours but I thought blues might look gorgeous. What do you think? Materials used: Stamps – Crazy About You, Endless Thanks; Ink Colours – Smoky Slate, Tempting Turquoise, Pacific Point, Pear Pizzazz; Rhinestones and Wink of Stella. And finally, something a little more different. No grey background this time. Instead, I decided to work on a white landscape base so that I could really make the flower and leaves pop. The Hello die from the Hello You Thinlits was a very easy way to finish off the card. 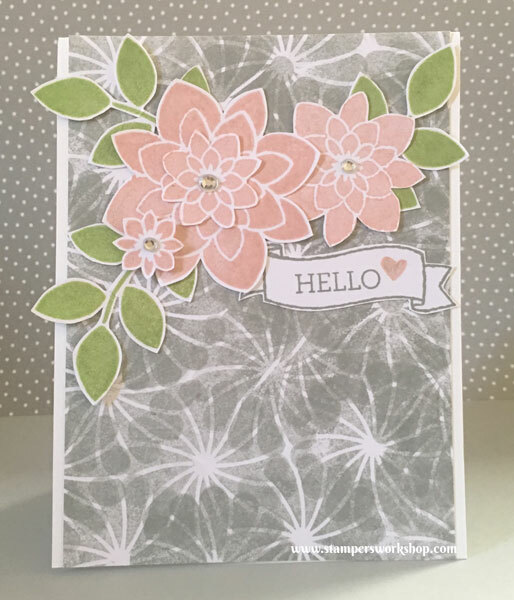 Materials used: Stamps – Crazy About You, Endless Thanks; Thinlits – Hello You; Ink Colours – Blushing Bride, Pear Pizzazz; Rhinestones and Wink of Stella. And there you have it! Eight “similar but different” cards! Thanks so much for sticking with me through to the end. I know it is a loooong post. Hope you have enjoyed seeing the different variations. Do you have a favourite? Will you try creating a card with the grey background? I’d love to know. If you do, please leave me a comment below. Thanks!